Все просто замечательно Близко к метро, фонтанам, магазин, рынок, даже остановка с обзорным автобусом. Лучшего места нет, если планируется посещение фонтанов. The apartment ADN 32 is located in Sants area. Metro stop - 135 m.
Metro stop - 331 m.
Plaza de España - 0.39 km. El apartamento está muy bien situado, en la zona de Plaza España, muy bien conectado con el metro y bus. El apartamento es coqueto, luminososo, bien equipado. Justo al lado hay un mercado y todo tipo de supermercados y tiendas. Très fonctionnel, très bien placé, proche de toutes commodités. Parking sous-terrain sécurisé très proche. En general, un buen apartamento con todo lo necesario y con buena ubicación y buenas conexiones. Detalles a mejorar: el secador se murió al encenderlo, una luz del salón se fundió y falta una mano de pintura. Very good experience. Timely meeting with the check in representative. Everything well explained. downsize was some hardware (water boiler and the sofa) not working but did not interfere with the stay. The Habitat apartment was very clean, modern and well appointed with kitchen, laundry and bathroom appliances. We highly recommend this accommodation. Metro is nearby and abundant restaurants and shops up and down the street. Charlie, who met us at the apartment, couldn't have been more helpful. Très bon séjour à Barcelone. Appartement agréable et très bien situé à proximité du marché, des transports en communs et de la place d'espana. Die Wohnung ist sehr gut ausgestattet, die Lage super. In direkter Nachbarschaft Bäcker, Markt, Supermarkt, Restaurants, Metrostation Hostafrancs und Buslinie D20 geradewegs zum Strand. Wir wollten die Wohnung im Oktober nochmal buchen, diesmal für unsere Kinder. Leider schon ausgebucht. Nicely renovated apt, clean and lux with fairly brand new appliances. Nice light from two balcony areas. Walls are thin and everything from talking to music can be heard loud and clearly but it is quite in the evenings. Also, the metro which is right underneath can be felt under your feet vibrating and it is constant. However, it is literally at the door so really convenient, it goes both ways. The neighborhood is not the most beautiful but has all conveniences nearby. Very nice apartment, good loctation. Excellent location metro just seconds away and tourist bus stops at the front door. Very tidy really modern would defiantly reccomended and we would defiantly stay here again. We had a truly pleasant stay in ADN32 apartment. Very conveniently located (5 min walk to Pl. Espanya), Bus Touristic stop is just in front of the door of the house. The apartment is light, spacious and with all necessary kitchen appliances (citrus juicer, coffee machine, toaster). There are two balconies – one facing a busy street and the other to the courtyard. Windows are soundproof, so there were absolutely no problems with sleep. Lots of nice places for eating out nearby, several bakeries, a market just around the corner and metro station very close. Large Mercadona supermarket in Les Arenes Shopping Center on Pl. Espanya. Thank you very much, we had a great time in Barcelona and we will be definitely coming back soon! très bel appartement et bien situé. A seulement 50 mètres du métro et 5 min à pied de la place d'espanya. Appartement bien agencé et confortable. Immeuble calme ainsi que lorsque les fenêtres sont fermées. On entend un peu les vibrations du métro (3 ème étage).Il manque quelques équipements dans la cuisine comme une nappe. Séjour très agréable et agence très professionnelle ( nous sommes arrivés à 22h30 et la personne était déjà sur place). PERFECT!!! EXCEPT THE FACT " FALTABA UN TENDEDERO PARA SECAR LA ROPA DESPUES DE LAVARLA Y EN LA COCINA AMGO PARA COLGAR EL REPASADOR/PAÑO" THANK YOU, GOD BLESS YOU!! / Habitat comments: Gracias por su evaluación. También nos gustaría darle las gracias por sus sugerencias y las utilizaremos para mejorar esta propiedad. This Barcelona Apartmenr is a new addition to our selection. The nice terrace invites to have a relaxed dinner after a long day of sightseeing. Modern and comfortable apartment in Barcelona with lovely Terrace. Located in the traditional district of Sants with easy access to public transportation. 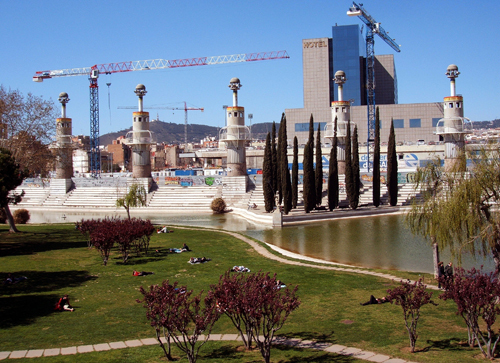 Just steps from Plaza España.